Hi friends, Mera again. Katie is working away on her dining room, so this week you get a double dose of me. I’m secretly glad, because I am excited to show you something I made that I’m really proud of: Opal’s teepee! Kids’ teepees are definitely having a moment right now, and I am a major sucker for a fort, so I gave it a go and made one for my girl. I am both a lazy and impatient seamstress, so making this teepee was a coup for me (my master-seamstress mother-in-law helped too!). 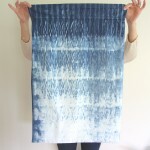 I wouldn’t presume to do a tutorial–my process was far too rough and tumble to pass along–but I’m glad to show you what I used for materials and where I looked for guidance and inspiration. After gathering my materials I scoured the internet for a proper tutorial. I didn’t find one that I particularly followed, but I gathered bits and pieces from this site, and this one. 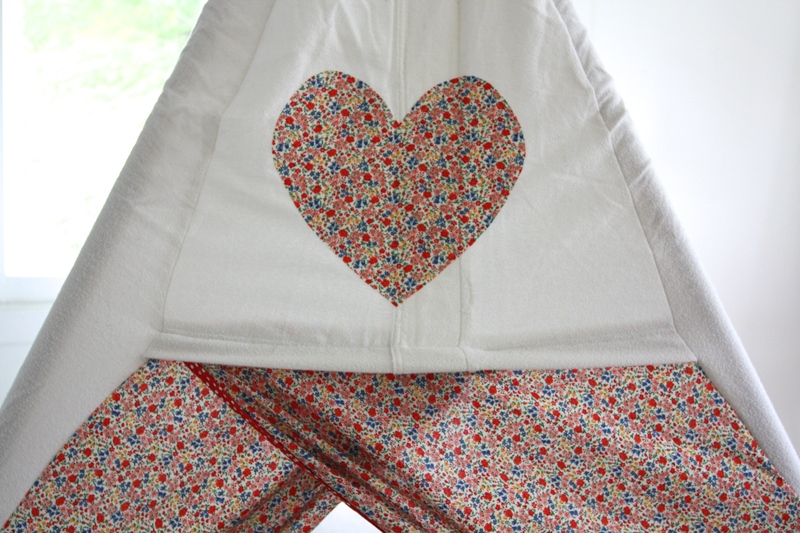 I also got the idea for the heart from the beautifully made teepees on this site. I wanted to make a large teepee, in the hopes that it will have a long life as a beloved fort and reading spot. Using the size of the sheet as a guide, I figured out how large each of the five panels could be, and how much would be left over for the top front panel. As you can tell from my scribbled notes, I really did just make it up as I went along. 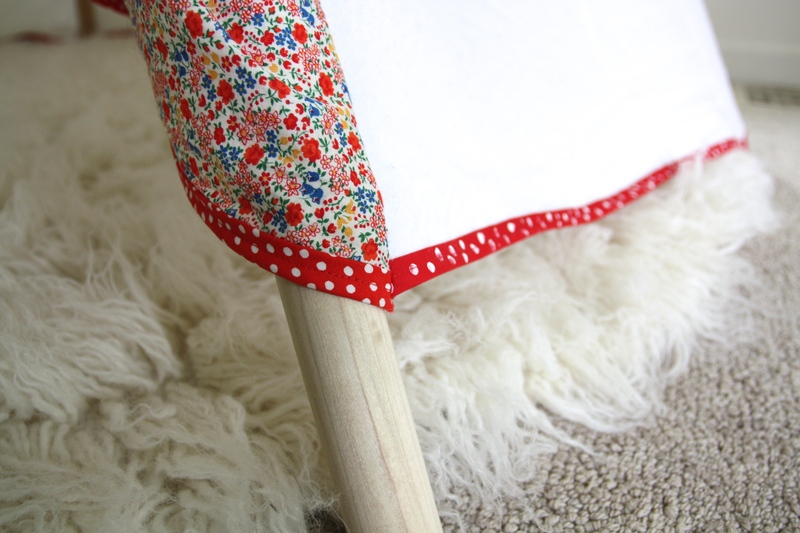 I had a small amount of vintage red bias tape with white polka dots on it, just enough for the door panels and top of the teepee, but not enough to go around the bottom edge. I couldn’t find anything similar to the polka-dotted version, so I used plain red bias tape that I had on hand, and painted little white dots on it using white block printing ink. It’s an imperfect fix, but enough to trick the eye into not seeing the difference. By the time I got to the front top panel of the teepee, the only part of the sheet left was the hemmed edge (that goes at the top of the bed). It looks a little silly, but the heart helps to at least partially conceal it. 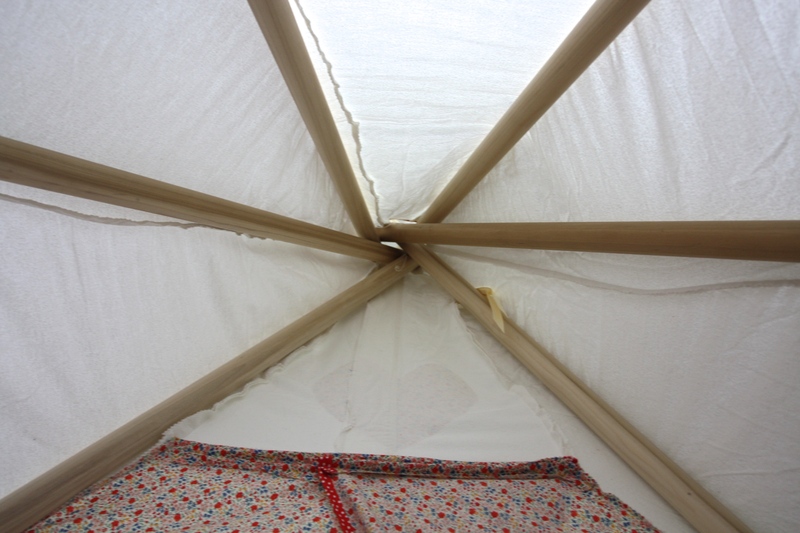 Inside the teepee is actually really cozy, even for adults. It gets warm in there, and it’s a great spot to read book after book with Opal. 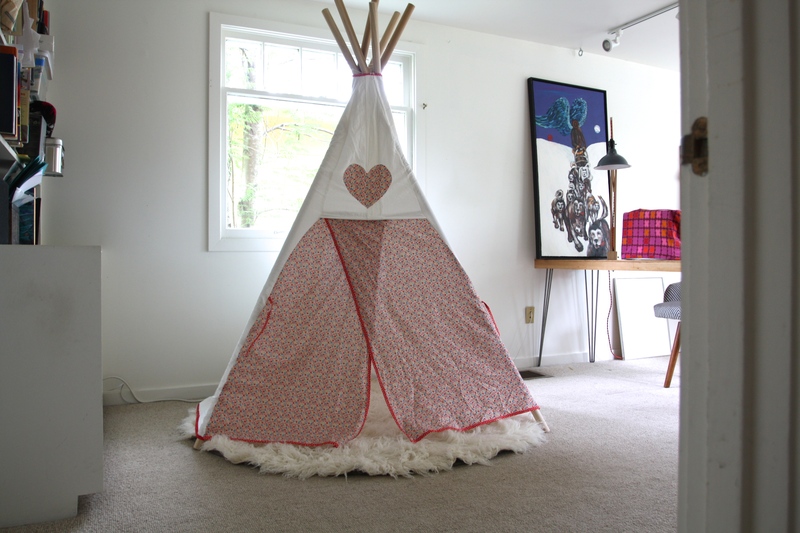 The teepee is up permanently in our play room/craft room/office/room where we stash things we aren’t sure what to do with. It’s a big beautiful room (although not at all organized, let alone decorated) in this house of pint-sized spaces. I’m not sure what the room will eventually become, but for now it’s great to have a space where Opal can play or read while I work on projects or catch up on email. Wolsey and Opal are not the only ones in my family who look at Katie with wonder and adoration. I’m so pleased with how it turned out. 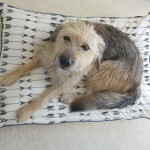 With the addition of the round flokati rug (which I bought here) and lots of pillows and blankets it’s a cozy hideout for cats, kids, adults, and dogs alike. 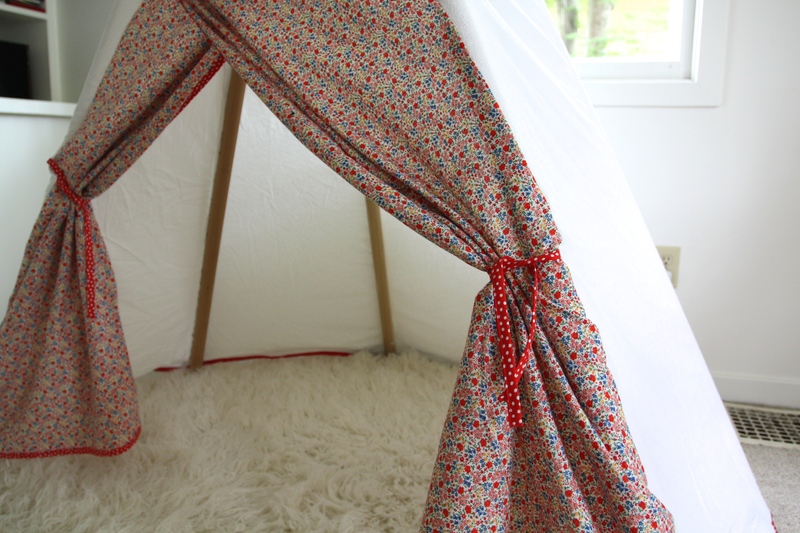 If you’ve ever considered making your own teepee fort, go for it! 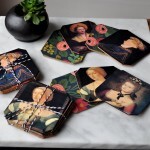 They’re pretty expensive to buy and if I can make one, you definitely can (and I’m happy to try to answer any questions you have in the process). 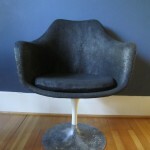 Check back on Friday for Good Score (there’s still time to send in pictures of your thrifted glory! 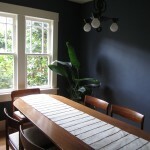 ), and next week for an exciting update on Katie’s dining room. Hint: it involves the discovery of a local Farrow and Ball-like paint manufacturer! 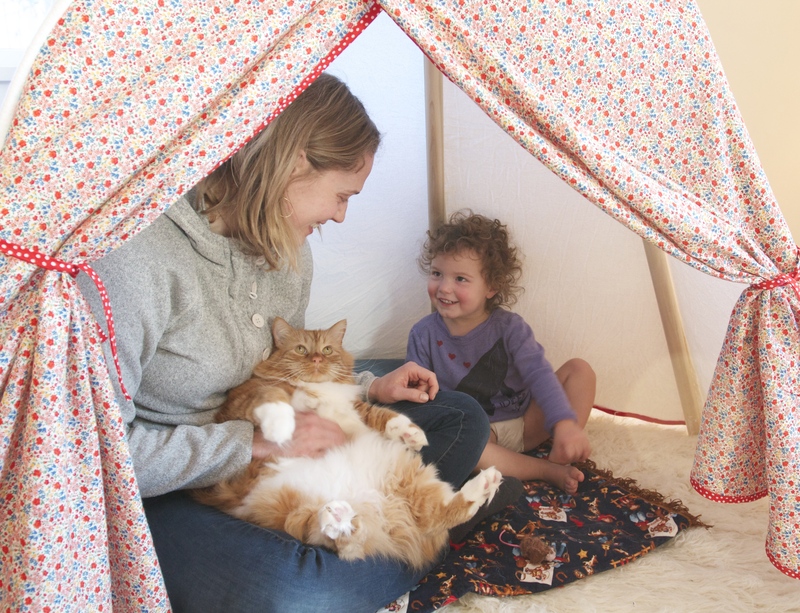 Fat cat and friends in a very friendly floral tepee…that’s a tongue twister. And what a sweet friend she is. I love that picture–Opal is gleeful to be with “Friend K-T” (as distinct from Granny K-T) and Wolsey is drunk with love. Thank you, Susan! 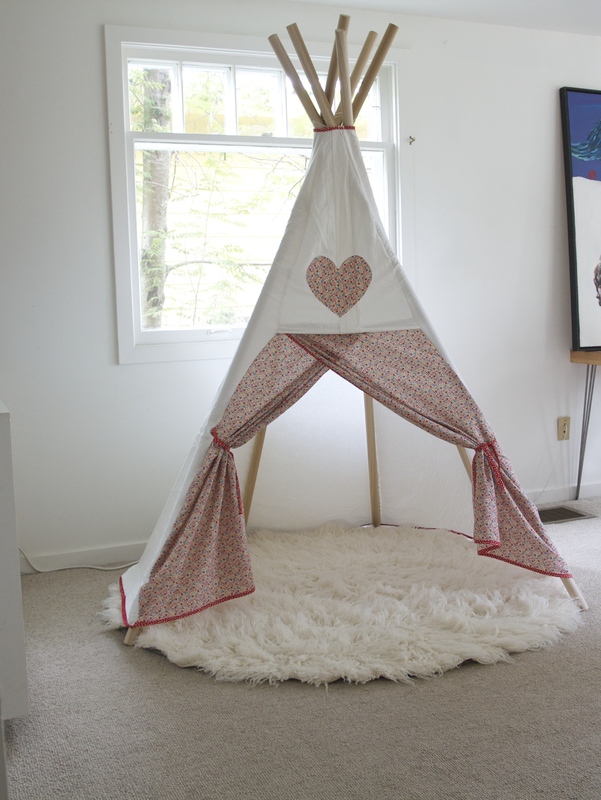 Such a charming teepee! 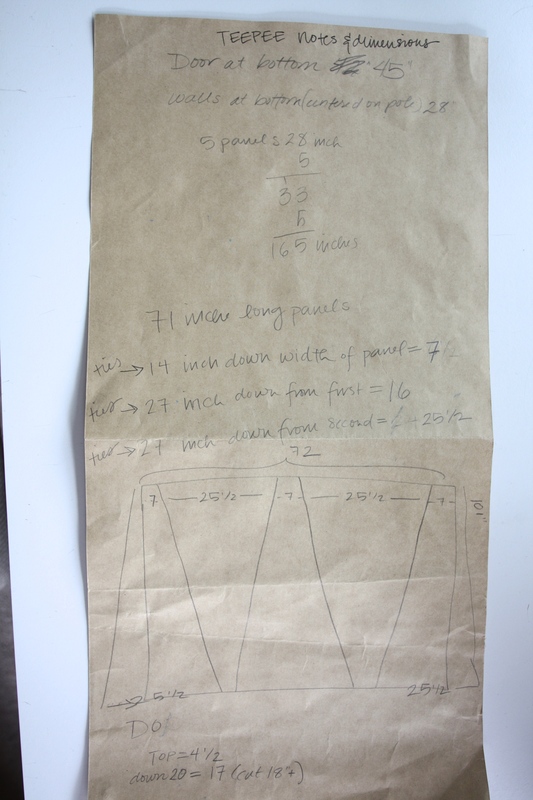 What you call your “rough and tumble process” is pretty amazing to watch – scribbles on a grocery bag becoming a diagram to cut a huge flannel sheet – and cut it so the triangles actually go back together. 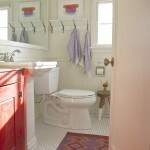 You will say “anybody could do that” – and that’s a plus about this post, you make it look very possible to have such an inviting space. And one thing that is totally cool about the teepee is the way it can collapse into a skinny state to store tidily behind a door, should need be. That picture of Katie and Opal seems to be all about love and friendship. I love to be your sous sewer – you do all the figuring. I forgot to point out earlier that Opal looks particularly sweet in that photo because she is wearing a Tshirt with your famous “Deep Love” print! Love Opal’s snazzy retreat! I had a similar teepee in Idaho for little ones and it was a fun spot! Gave it away not realizing we would have a GREAT grandchild! Darn! You are really amazing. Not only making a great teepee, but painting the white dots on the trim. And now you have a record of your process and all the love that went into it for Opal to read someday. Wonderful photo of two beautiful women and one handsome guy inside the shelter! Wolsey thanks you for calling him handsome instead of choosing an adjective that well describes his shapely figure and conveniently rhymes with ‘cat.’ I love to think of Opal looking back at this someday, and to make the record more complete I should confess that I seriously downplayed how much Granny Katy helped with every step of this. Thank you Carol!